The easily recognized pungent, musky odor might be the first clue New York motorists have of the roadside slaughter that begins this time of year. Once experienced, the smell of the ubiquitous striped skunk is never forgotten. By Valentine's Day, male skunks begin to stir from their winter lethargy and begin to roam the land in search of a mate. A vigorous, highly motivated male may roam over 10-miles on a warm spring night in search of hot skunk love. Unfortunately many of these amorous animals end up flattened onto asphalt giving up their defensive scent in the process. Scientists who study roadkill, (yes there are scientists who study roadkill) claim a million animals a day are killed on the nation's 4-million miles of highways. Skunks are not alone. An estimated 6-million cats , for instance are killed each year by vehicular traffic, a million more than are euthanized in shelters. Because of the unique odoriferous aspect of squashed skunk motorists are more aware of roadkill in general, but millions of deer, fox, raccoon, woodchuck, squirrels, chipmunks, rabbits, opossum, birds, turtles, frogs and snakes are killed every year without as much notice. The primarily nocturnal striped skunk, (Mephitis mephitis) is a member of the weasel family, related to the mink, otter and fisher. 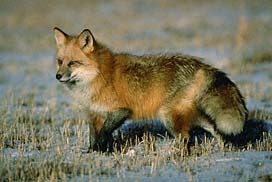 Its glossy fur was once prized in the fur trade for use in garment trim and ornamentation. Musk from the skunk's notorious scent glands has also been used in the making of perfume. The musk, once the odor is chemically removed, is especially valued because of its clingy, long-lasting quality. In New York, the striped skunk has been protected under environmental conservation law since the late 1800s, but in its day, trapping of skunk, raccoons, muskrats and red fox was big business and an important source of income for rural populations. These days a striped skunk's greatest predator is the automobile. Researchers believe roadkill rates for skunks more than double during mating season. Other natural predators include owls, fox and coyotes. Despite its reputation a striped skunk is unlikely to resort to spraying unless in mortal danger. 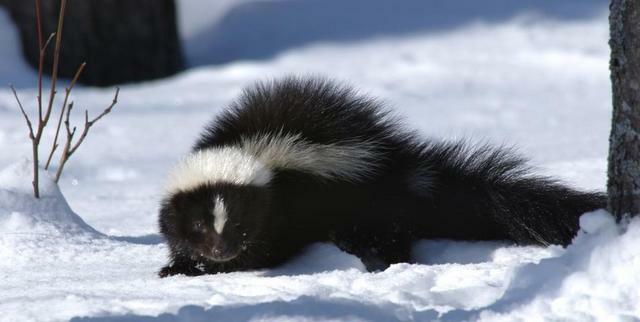 When threatened, before spraying, a skunk will arch its back, raise its tail and make a warning noise by chattering its teeth. A quick and quiet retreat will usually calm the skunk. But, if attacked, spray it must. The acrid, biting spray can reach 10-15 feet or more if a wind carries the eye-stinging mist aloft. Except during the March mating season, skunks are loners, males taking, no part in protecting or feeding the young. Females give birth after a 65-day gestation period, raising four to seven kittens for about six weeks when they are weaned and begin to follow mother around in search of food. Skunks are opportunistic feeders, dining on insects, small lizards and frogs, bird eggs, fruits, nuts and, as many homeowners know, dog and cat food and human garbage. As the striped skunk's habitat declines preferred dens underground, in hollow logs and under farm yard outbuildings have disappeared forcing skunks to seek shelter under porches and sheds in urban and suburban neighborhoods. Many horrified m dog owners have learned of the unpleasant consequences of living in close proximity with the striped skunk. The Roadkill Chronicles are a seasonal record of wildlife species found dead, maimed, splattered and squashed on the roads and highways of the North Coast—the closest view many of us ever have of the other animals with which we share the land. 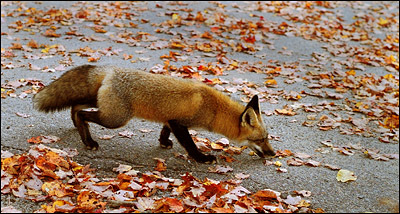 "First, I gotta kill all the foxes..."
I met a man walking with two beagles the other day along the towpath on the Erie Canal. Both dogs were wired up to a radio transmitting electrical shocking devise. I asked the dog's owner who was uttering quick, deep voiced, sharp commands to the dogs who, for all I could tell, ignored him. When I asked what he hoped his dogs would do for him he said, "rabbits." I asked, admittedly facetiously, if they found many rabbits on the canal bank. He just as tersely told me, "too many fox." " A shame," I agreed, "there are a lot of fox this year." It's true, although I've found no one able to tell me why. "But I got a 150 acres a friend is gonna let me use to hunt rabbits. But first I gotta kill the foxes."